Regular readers will acknowledge my reservations of this market for over 4 weeks before the latest correction (heck, you can always check the blog archive to the right). I could restate everything that has happened in the past 2 weeks, but that’s just 20-20 hindsight. The chart above shows the number of stocks in the S&P 1500 Index that are currently in stages of Accumulation (money flowing in) and Distribution (money flowing out). As always, click on the chart to enlarge it. A bunch of red there. 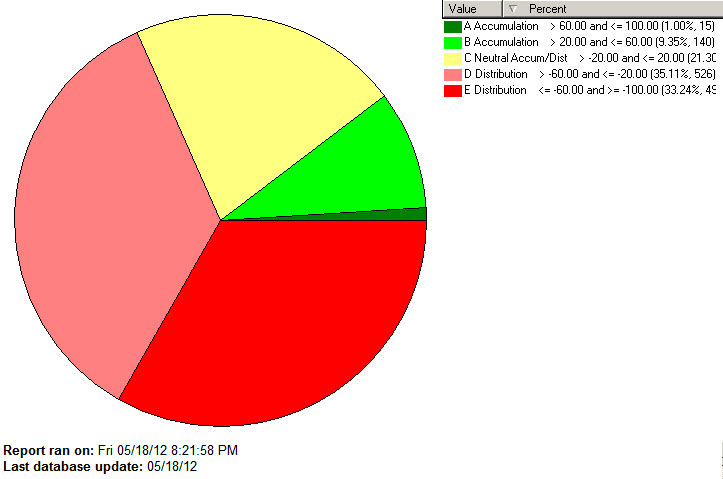 10% in Accumulation, 68% in Distribution, the rest Neutral. Pretty heavy selling. Next is the price action. 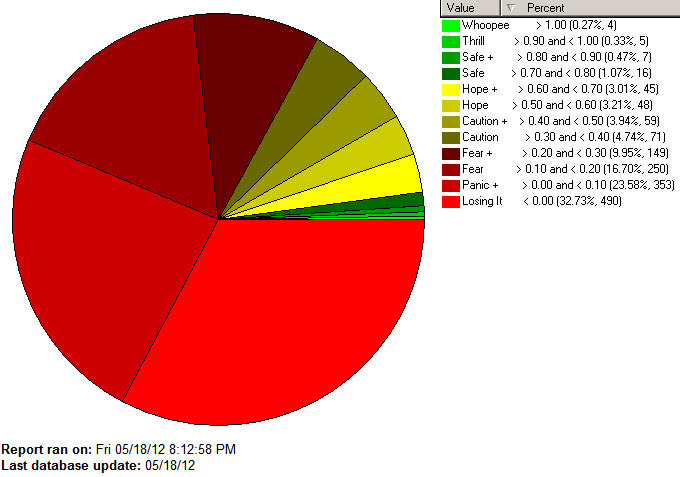 Only 2% have strong positive price action, 15% neutral, 83% weak price action. All one has to do is look at an Index chart to see that prices are down and down hard. Which leads me to the future. How long can this go on? theoretically for a lot longer, but realistically we are (very) due for a corrective bounce up. And the action during that bounce will be an important indicator of the future. A meager few days up move on narrow spreads (difference between the high & low price), especially on strong volume will indicate investors selling into any rally attempt. Strong up bars, even on moderate volume (high volume preferred), exceeding previous support levels would be a positive (buyers coming in). So this next bounce is important to read. When will it come? I think soon, we’re overdue for it. Since this market is weak overall, it will continue to be driven by news and that’s the wild card. There are plenty of sources for bad news and only a few for good news, but watch how the market reacts to news. Strong markets have a minimal reaction to bad news and weak market will have a minimal reaction to good news. That can be a tip-off as well. Untill then stay defensive. There WILL be a good buying opportunity, the only question is when. What is strong? Well the top 6 on my radar are all short sectors (i.e. funds that go up when the sector goes down). The only decent longs are Biotech, Government bonds and Utilities, all defensive plays. Watch the bounce, it could be a long hot Summer until we get a reliable “OK to re-enter” sign. The internal market structure needs help soon, or we could be headed a lot lower. Have a good week, and please feel free to comment. I can tone the content down or amp it up to suit my audience . . . you. 🙂 ……. Tom …….